Greil Marcus has often written about the “secret histories” of music. The idea is to bypass the generally acknowledged masters of any genre, looking instead for the songs, thoughts and artists behind them; the true form innovators and innovations whose presence and example provided the template and inspiration for these better-known musicians to extend their work into previously unmapped territory. One of these key “secret” figures is Bruce Langhorne. Everyone who has ever worked with Bruce describes him as a person whose very presence changes the atmosphere of a recording studio. Besides the genius of his musical approach, Bruce possesses the ineffable it that really matters. 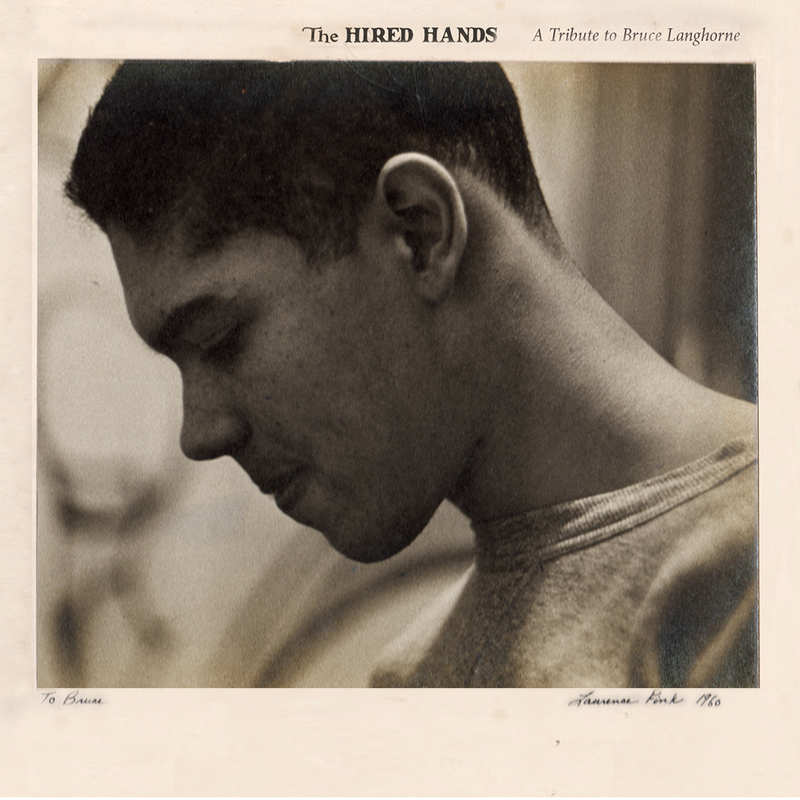 Bruce Langhorne was born in Tallahassee Florida in 1938, where his father headed the English Department at Florida Agricultural & Mechanical College for Negroes (as it was then called). When his parents separated in 1942, he moved to Spanish Harlem with his mother, where she ran the Harlem Library System. Bruce went to Horace Mann and was reportedly on his way to becoming a world-class violin player, when he blew off parts of his right hand screwing around with a homemade rocket at the age of 12. This ended his violin career, but he eventually picked up the acoustic guitar and began playing on the street in Provincetown, MA in the late 1950s. The gig was with a caricaturist, who would do quick sketches of the strollers who stopped to listen to Bruce's playing. Because of his accident -- he lost his thumb, index and half of the middle finger -- Bruce developed a style with precise note placement and subtle harmonic voicing. Not that any of the tourists would have noticed. When Langhorne drifted back to NYC, a friend introduced him to Brother John Sellers, a gospel and folk singer who recorded for Vanguard. Sellers was also about to start working as an emcee at Gerde's Folk City. This was 1960, and Sellers was impressed enough with Bruce's playing to enlist him as his accompanist for the gig. Folk City quickly became the nexus of the Greenwich Village music scene, and Bruce was in the center of it. Everybody came to Gerde's, and as that included label heads like Maynard Solomon and A&R guys like John Hammond, Langhorne began getting session work as soon as the folk recording boom began in earnest. Langhorne's first sessions seem to have been with The Clancy Brothers and Tommy Makem, a group of Irish ex-pats whose traditional song style had a big influence on the early Village scene. More important, however, was Langhorne's Autumn 1961 work on Carolyn Hester's eponymous third LP, her first for Columbia. A yet-to-be-signed Bob Dylan also played on the session, and Langhorne struck up a friendship with Hester's then husband, Richard Farina, who was working on his novel Been Down So Long It Feels Like Up to Me. Bruce played on other sessions, for Casey Anderson, Chad Mitchell and various folkies, before he was asked to sit in on Bob Dylan's second album the acoustic Freewheelin', and the semi-electric promo single that came out with it, “Mixed Up Confusion.” In retrospect this was an important if curious session. But it was one of many. More notable was Langhorne's work on Richard and Mimi Farina's two Vanguard LPs, recorded after Farina had met Joan Baez's younger sister Mimi on a trip to Europe. Breaking with Hester, the pair formed a musical union that lasted until Richard's death in 1966. Richard was a very unorthodox dulcimer player, and the sound of his instrument played against Langhorne's electric guitar is incredible. Under the influence of his Village pal, Sandy Bull, Langhorne would clamp a soundhole pickup to his 1923 Martin 1-21, and run it through Bull's Fender Twin Reverb, which he regularly borrowed. Through Sandy, Bruce had become a fan of Roebuck “Pops” Staples' heavily rhythmic tremolo guitar sound, and the results were sublime. Bruce would also pull out his gigantic Turkish tambourine and do percussion licks when called upon. This was used to excellent effect on the Farina sessions, and also inspired Dylan to write the song, “Mr. Tambourine Man,” for his Bringing It All Back Home album, another session on which Langhorne made brilliant additions (albeit, uncredited at the time). Although Bruce was usually most comfortable playing a supporting role as a guitarist, he played the great electric lead parts on “Subterranean Homesick Blues” and a bunch more. Langhorne also performed live with various people -- a one shot with Dylan on the Les Crane Show and regularly with the Farinas -- and he was omnipresent at sessions by big names like Odetta and Joan Baez, as well as cult faves like Fred Neil, Pat Kilroy's New Age Trio, Tommy Flanders, Peter Walker, Penny Nichols, John Braden and Mel Lyman. He was even enlisted to produce Ramblin' Jack Elliott's Reprise LP, Young Brigham. Bruce was also doing a lot more percussion as time went on, and he became friends with South African ex-pat trumpet player, Hugh Masekela. Masekela had guested on the Byrds' fourth album, Younger Than Yesterday, and through them had met Peter Fonda. Hugh wanted to do an album with Fonda on his own Chisa label, and hired Bruce to work with Peter on an LP to be called Got to Get You Into My Life. Only one single, the cool “November Night,” was ever issued from the sessions, but Fonda was amazed by Langhorne's musicianship. When Fonda was given an opportunity to direct his own film, following the success of Easy Rider, he chose Langhorne to create the soundtrack to his beautiful, atmospheric 1971 Western, The Hired Hand. The solo guitar, fiddle and banjo instrumentals are exquisite, perfectly suited to the film, and just gorgeous on their own. Crazily, a soundtrack of the film was not released on its own until Blast First did it on CD in 2004 (followed by Scissor Tail's vinyl version in 2012). But the few people who were lucky enough to see this remarkable film in the meantime were uniformly haunted by the music as much as by the images. It was Langhorne's first solo album, and it was a true subliminal hit. As the '70s unwound, Langhorne focused largely on co-running Blue Dolphin Studio with Morgan Cavett, and doing film scores. Fonda chose Bruce again to his second film, the dystopian hippie time travel saga, Idaho Transfer. This is another really interesting flick, and Langhorne's work expands to include synthesizer and other keys. In '76 he did Bob Rafelson's Stay Hungry and Jonathan Demme's Fighting Mad (staring Fonda). Langhorne worked again with Fonda on Outlaw Blues and Demme on Melvin and Howard. He actually did Demme's Swing Shift too, but most of Langhorne's music was scrapped when Warner Bros. took the project away from Demme. Soon after, in 1980, Bruce shucked Hollywood and moved to Hawaii to raise and harvest macadamia nuts. This proved to be a better concept than a lifestyle, so Langhorne moved back to Southern California in '85, playing percussion with ex-pat Nigerian drummer, Babatunde Olatunji, and others. He also did some more soundtrack work, generally using keyboards. But as the '90s moved along he began to have health problems. First he was diagnosed with Type II Diabetes, which inspired him to found a healthy hot sauce company. A stroke followed a few years later. And he had to give up guitar, although he did record a solo album, Mr. Tambourine Man, on keys and percussion. Bruce's health has continued to fade, but his legend and reputation grow ever brighter, especially as the music from The Hired Hand becomes more widely available and the playing he did for Dylan is officially acknowledged. This album is a celebration of the incredible influence his largely secret trajectory has cast over a wide variety of musicians. By itself it's a great collection of music, as a tribute to Langhorne I think it's even more amazing than that.